Here at Bradfords coach Hire, we hire out minibuses and coaches in Bradford and the surrounding areas. We are one of the main providers of minibus services in the Bradford and are competitively priced. Our professional staff have over 10 years of experience in the minibus field and have an extensive knowledge of all coach transportation. We understand our customer base and have a range of minibuses and coaches to cover their needs. 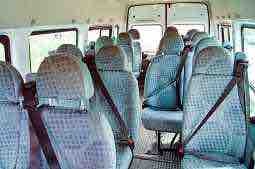 We have bd1 approved minibuses in 8 seaters, 12 seater, 14 seater and 16 seater capacities. 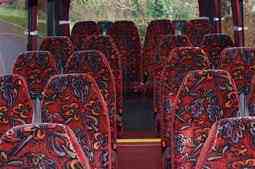 We also have coaches that have 24, 29, 33, 39, 49, 53 and 72 seats – ideal for larger parties. We supply hire vehicles for nights out, hen and stag dos, airport drop offs and pick ups and a range of other activities. We cater for a range of people from a range of professional and personal backgrounds. Our services are delivered in a professional, polite and knowledgeable manner. Transportation hired is suited to the nature of the activity and the number of people travelling. 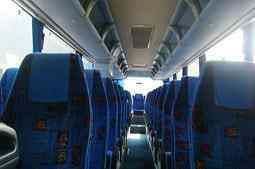 Our minibuses and coaches regularly serviced and are cleaned on a weekly basis. We do this because we want our transport to be spotless, reusable and visually appealing. Customers have often commented on amenities on board our minibuses and coaches and often use us again because of the professional service we provide. Some of our larger minibuses and coaches come with hired drivers (if needed and dependant on the nature of the activity). All drivers are fully licenced and have years of experience under their belts. Moreover, they are used to take hen, stag and other large groups around the United Kingdom for their chosen activities. Our drivers have a wonderful sense of humour, which only adds to the positive atmosphere you will feel on our coaches. It is very easy to book, all you have to do is telephone us or book online. Prices are dependent on the size of your party and where you want to go. A full price list for all transport is available on our website and over the telephone. If you do find a better quote from one of our rival companies, we will attempt to match it or beat it. When you make a query or want to book transport, we need to know where you intend to go, the size of your party and the nature of the occasion. This will allow us the necessary time to prepare the vehicle for use. We often have customers making special requests because they are hiring a vehicle for a special occasions; if this is the case, then allow necessary preparation time so we can tailor the requested minibus/coach to your needs. Decorations are permitted on our transport, as long as they are sensible and will not distract the designated or hired driver. We want all parties to have a good time, whatever the celebration, but we do not want safety to be compromised. The National Media Museum is located in Bradford and is ideal for those who have a vested interest in current affairs from the past and the present. The museum documents the growth of media in the United Kingdom and the impact it has had on the growing population. Another place of interest in Bradford in the National Industrial Museum. In the 18th century, Yorkshire was the epicentre of the industrial revolution. Importantly, the museum is a wonderful pictorial representation of the growth of industry in Bradford and the surrounding areas. This museum is worth a look to those tourists interested in the history of the United Kingdom. Bradford Cathedral has been a centre of worship since the 8th century. The church was rebuilt in the 15th century and has some spectacular internal features. It is extremely popular with tourists because of its interesting past. The Bradford Alhambra is located in the centre of Bradford and is architecturally based on the Alhambra Palace inn Granada, Spain. It was constructed in 1913 for a cost of £20,000 and was opened a year later. Bradford council bought the building in 1974 and it is now a listed building. 2015: Bradford Car Classic takes place at City Park on the 15th August. The show will display 150 classic cars and run between the hours of 10 am and 4 pm. 20 related car stalls will be put on so the public can sample the true delights of classic motors. Bradford Food and Drink Festival takes place on the week of 30th-31st August. Local businesses join forces with Jamie’s Ministry of Food to display the culinary delights Bradford has to offer. Cuisine from all over the world can be sampled in this superb festival. On August 25th outdoor theatre will be on show at East Riddlesden Hall. Shakespeare’s Twelfth Night will be shown in all of its original glory. The setting for the outdoor theatre is picturesque and postcard perfect. 2016: Bradford Literature Festival takes place on 20th-29th May. It gives the general public and tourists the opportunity to listen to readings from famous poets and authors and get involved in interactive workshops that hone writing skills. 2017: Why not celebrate New Year in Bradford? It has a host of high-class hotels and restaurants that offer cuisine from around the world.